Copyright �2012 PopEntertainment.com. All rights reserved. Posted: February 8, 2012. The pioneer of theatrical shock rock, Alice Cooper, has returned with an exceptional new album, Welcome 2 My Nightmare. While not officially a sequel to his acclaimed 1975 opus, Welcome to My Nightmare, this new release, also produced by Bob Ezrin, captures the macabre inventiveness of that legendary release while maintaining a modern edge. 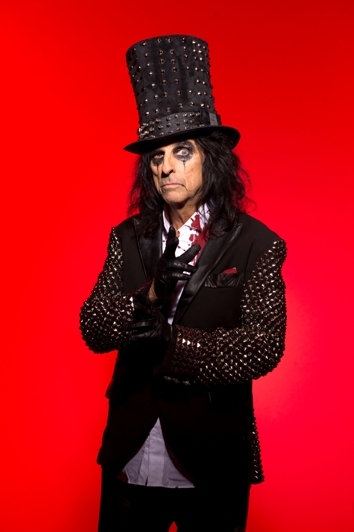 Fresh off a hugely successful European jaunt, Alice Cooper spoke with Popentertainment.com writer Ken Sharp about his latest opus. You�ve just returned from an extremely successful European tour. I�ve been to Europe twice this year and done two big tours. One of them was a big outdoor festival tour and the second one started in Italy. Every single member of the audience was between 15-25 years old. It was the weirdest thing to have that many young kids watch Alice Cooper. And it was like that in every single country, whether it was Italy, France or Germany. Between Facebook, having a new album, the Rock and Roll Hall of Fame and doing a movie with Johnny Depp, all worked towards getting a lot of attention from the younger kids. So Welcome 2 My Nightmare isn't a sequel to your Welcome to My Nightmare album? No, it's not. In all honesty I used Welcome 2 My Nightmare because it was so damn clever (laughs) with the �2� in it. It�s just another nightmare. I figured why not give Alice another nightmare. We gave him a nightmare in 1975. We all looked inside Alice�s dreams and said, �Wow, how weird is that? Who wants to look into Alice�s brain from 1975 to 2011?� All new things are happening with technology. Disco is now hip-hop. The devil is not some big scary creature; the devil is Ke$ha (laughs). So that�s what I wrote about. I tried to put Alice in a lot of surreal places and let the audience in on it. Bob (Ezrin) and I decided like a nightmare� things in nightmares are usually bizarre but at the time they make sense. When you�re in a room and it fills up with water and you�re swimming with sharks and somebody�s playing poker, at the time it seems very logical. When you wake up you go, �What was all that about?� That�s kind of the way we let the album go. We made it so one minute Alice is on a runaway train � so let�s make that song sound like that. The next second he�s the last man on earth � so let�s make that totally different from �Runaway Train.� The next second he�s hit with �The Congregation,� okay let�s jump to this look. I don�t think there are two songs on the album that sound alike. The record does not sound dated, it carries classic overtones with a modern touch. I think it�s the storyline and Alice�s voice. I speak of Alice in the third person. When I perform as Alice he�s in the third person and when I record as Alice he�s in the third person, so I feel very free talking about him in the third person. On this album Alice�s voice and attitude is what keeps it all in one piece. You go back a long way with producer Bob Ezrin, who worked with the band on many of your biggest records. He returned to the fold on the new album. He brings out the worst in me and I bring out the worst in him and that usually makes for a good Alice Cooper album. Bob Ezrin will not let you put filler on an album. He says there�s no such thing as filler. Every single song has got to be a song; it can�t just have a riff and a lyric. It has to be a song that you can sit down at the piano and play. That�s the way I was taught to write. You can�t just throw a schlock melody line in there. Bob won�t allow it. He�ll say, �That melody line doesn�t make sense, let�s work on it.� He brings out so much in me. I would usually stop and think something is good enough. It�s not because I�m lazy, Bob hears something in my voice that I don�t hear. He�d go, �Do you remember that thing we did on Alice Goes Back to Hell? You were verbally jousting with the devil and that voice we used� That�s the voice we want to use here.� And I�ll go, �Yeah, I see that, let�s do it.� Bob knows my voice better than anyone else, so we use Alice�s voice as an instrument and that�s what�s great about it. He�s the guy that can really pull that out of me. What�s your take on the music scene in 2011? The funny thing is musically nothing has changed. I listen to the Foo Fighters and I go, �This band would have been great in 1973.� They would have been just as good in 1973 as they are now. All the really good bands now are basically throwbacks to the �70s sound. I mean, look at the White Stripes, look at Jack White, he�s so blues-oriented but he takes it to a different place and makes it into something different. There�s nothing new under the sun musically. The only thing that has changed is the technology. How we record the albums. How we write them. How we buy them. How we listen to them. That�s all new but certainly not in the chord structures. We�re all still doing the same kind of music. You work with the original Alice Cooper Band sans the late Glen Buxton on several songs on the new album. Dennis (Dunaway), Neal (Smith) and Mike (Bruce), the whole original Alice Cooper Band were very, very creative guys. They never settled for, okay, that sounds good enough. It was always let�s twist it and take it here. Dennis Dunaway was always one of the most creative bass players around. Neal played drums like nobody else. He didn�t play drums like any other drummer I�d ever met. Mike was not a great lead player but he was a great rhythm player. And Glenn (Buxton) was the only guy who could sit down with Syd Barrett and make sense of what he was doing. It was a very unique band to start with. You take that and give that to Bob Ezrin, who�s classically trained, and you�re going to get a really different sound. One of your classic songs is �Elected,� which sounds like a Who outtake. Actually it was originally called �Reflected� and it was on the Pretties For You album that Frank Zappa produced. Bob Ezrin heard that song and went, �We need to take that song and rewrite it because it�s got a great hook in it.� We all went, �let�s give it the big power chord, the big Pete Townshend chord at the beginning. Let�s give it those big drums.� Keith Moon was a buddy of ours. I said, �Let�s tip our hat to The Who and do a big song like that.� I felt very comfortable playing that song because it felt that�s what rock should be. I still say that Pete Townshend is the best stage guitarist I�ve ever seen. That song sounded like a political rally. It was John Lennon�s favorite song of mine. John used to come by our office and listen to the acetate of �Elected� and he�d say, �I love that song!� He was very politically motivated and he liked that it was poking fun at politics. But it had power to it. Lastly, pick one song from the new record that tells the story. I�d pick �The Congregation� because it has this theatrical thing to it. It tells the story. He meets the congregation and he�s pretty sure he�s in a nightmare. Not only does it have a lot of Beatle tricks in it, but it rocks like crazy. Then it�s got theatrical parts in it that are very Broadway-ish almost. That�s always been an Alice Cooper signature. We�ve always used a little bit of Guys & Dolls here, a little bit of West Side Story � just enough in the arrangement of the vocals to make it Alice Cooper. We�ve always been very associated with a kind of warped Broadway. So I think �The Congregation,� while it�s not my favorite song, is the one that�s most representative of the whole album. 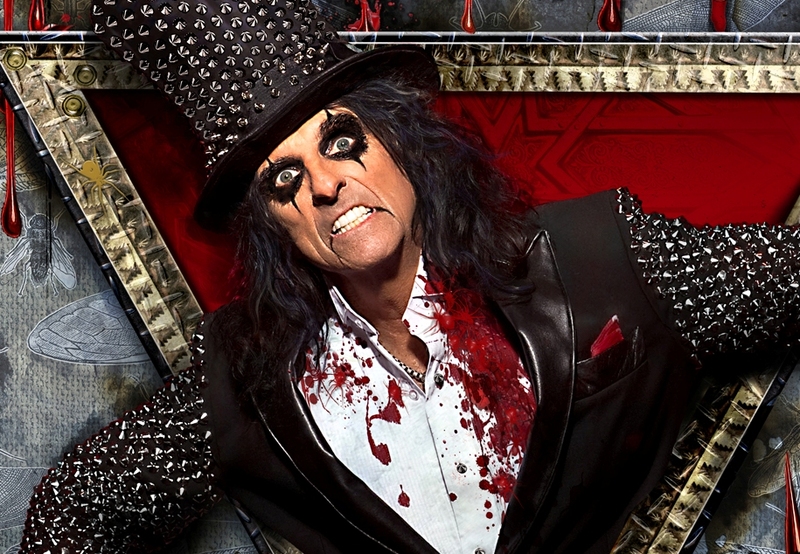 CHECK OUT ALICE COOPER'S NEW VIDEO FOR "I'LL BITE YOUR FACE OFF!" #1 � 2011 Courtesy of Universal Music Enterprises. All rights reserved. #2 � 2011 Courtesy of Universal Music Enterprises. All rights reserved.